Dinner and a movie go together like you and your Valentine: They’re the perfect pair, a classic. At AMC DINE-IN, we rewrote the script on date night by bringing you the best of both worlds — a restaurant and movie theatre — under one roof. Forget about stressful last-minute reservations this holiday. Enjoy a full menu of fresh, handcrafted dishes to pair with your favorite drink from the bar and a new release at one of our AMC DINE-IN theatres. Christian and Anastasia return for one last romantic adventure. The newlyweds get closer than ever, but it’s not all marital bliss. Just as the Greys begin to step into their new roles, sinister events come to light and jeopardize their happy ending before it even begins. Don’t miss the climactic finale of the FIFTY SHADES trilogy and give in to temptation with cocktails inspired by the film: Something Blue and Forbidden Fruit, available at participating MacGuffins® Bars & Lounges. Our bars are also stocked with the finest craft beers and premium wines. Celebrate the birth of show business with THE GREATEST SHOWMAN. The bold, original musical tells the story of a visionary who rose from nothing to create a mesmerizing spectacle that became a worldwide sensation. Bring the entire family to enjoy THE GREATEST SHOWMAN and traditional fare like popcorn, pretzels and candy. AMC DINE-IN’s extensive menu is full of handcrafted snacks as well as tasty meals, including salads, wings, flatbreads, burgers and mac & cheese. We even have a special menu for mini movie lovers. From master storyteller Guillermo del Toro comes THE SHAPE OF WATER, an other-worldly fairy tale set against the backdrop of Cold War era America circa 1963. At a top-secret research facility, a lonely janitor forms a unique relationship with an amphibious creature that is being held in captivity. The only thing sweeter than the storyline may be our mouth-watering desserts. Share in the wonder of THE SHAPE OF WATER over a Triple Chocolate Brownie Sundae or your favorite-flavored milkshake. 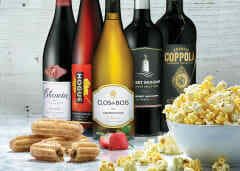 From Valentine’s Day through mid-March, our full-service AMC DINE-IN theatres are offering FREE Molten Chocolate Churros or a large popcorn with any wine bottle purchase $33 or higher. Make this Valentine’s Day more memorable and magical. Get your tickets for date night and check for an AMC DINE-IN theatre near you.